The most successful employers understand that companies are only as good as the people they hire. Not too long ago, hiring looked very different than it does today. While the days of paper CV’s are definitely over in most industries, there are still many employers who don’t fully understand how digital recruitment can help them and what its main benefits are. In this article, we explore the current trend of recruitment digitisation and explain why employers around the world are incorporating digital solutions into their hiring strategies at a rapid pace. More job-seekers than ever before can be found on various digital channels, such as online job portals and social media. Many of the same digital channels are also frequented by passive talent who aren’t actively job seeking but may be willing to change their job if a good career opportunity came up. In fact, the vast majority of passive candidates are open to new job opportunities, according to hiring statistics, especially when they offer room for professional development, better work/life balance, or higher compensation. By advertising jobs online and contacting potential job candidates on social media, employers can effectively increase their talent pools without spending money on costly recruitment schemes or traditional advertising, both of which are becoming increasingly irrelevant in today’s digital era. According to research firm Aberdeen Group, 73 percent of 18- to 34-year-olds found their last job through a social network, and it’s very likely that the number will only increase as more millennials and the members of Generation Z enter the workforce. It won’t be long before employers who fail to take advantage of the digital channels won’t be able to compete and will fade into irrelevance. Other online channels through which job candidates find employment these days include job aggregators, job crawlers, and Google Search. The last channel is especially important, but only a small percentage of employers know how to use it to its maximum potential. Because ninety-percent of job seekers use mobile at some point in their job search, employers must optimise their career pages for mobile devices and streamline the online application process so that it’s not hard to complete on a small screen. 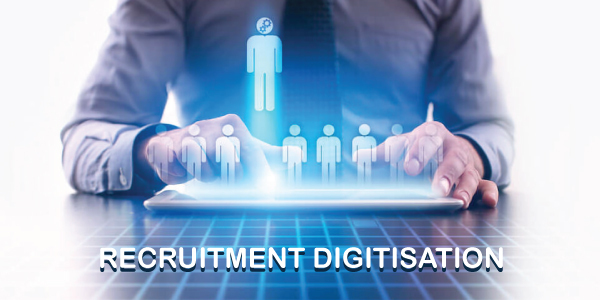 Modern digital recruitment solutions such as Direct Hire Recruitment Software help employers send adverts to job portals, social media, and other online platforms at the click of a button to generate high quality candidate applications with minimal effort. Direct Hire Recruitment Software is mobile-enabled and perfect for all employers who would like to accelerate their mobile adoption and be more accessible to younger scarce skilled candidates. A strong employer brand plays a critical role in attracting and retaining top talent in a competitive market place. Digitising the recruitment process will strengthen your online brand visibility and help expand your potential reach as well as ensure that the candidate experience is a positive one from their very first interaction with your organisation. Direct Hire Recruitment Software can send bulk personalised messages and automatically respond to online messages, making it the right choice for any employer that would like to attract the best young talent as well as seasoned job candidates with an online presence. In the past, the recruitment process started with a paper CV and cover letter and ended with a personal interview. Today, the CV is the sum of the candidate’s online activity, and job interviews increasingly often happen remotely, using modern technology such as video interviewing. In this environment, historical metrics, such as past employment and education, are much less valuable than they were just ten years ago. While their value will never reach zero, the focus today is on real-time and predictive metrics, which help employers understand the personality of candidates, their strengths, weaknesses, and motivation without asking them directly. Data is also providing employers with deep insights into the effectiveness of their existing recruitment strategies and enabling them to develop future strategies based on this valuable information. With recruitment software such as Direct Hire Recruitment Software, it’s possible to decrease cost per hire and time-to-fill all while reducing admin thanks to the automation of many day to day tasks. The world has changed radically over the last decade, but the recruiting practices of many employers have remained the same. To hire the best people today, employers can no longer afford to ignore the ever-growing digital landscape and all the opportunity it brings. They must digitise their recruitment strategies and use data and analytics to obtain rich insights into candidates otherwise they risk losing access to a talented workforce. Direct Hire Recruitment Software makes recruitment digitisation effortless, allowing employers to reap all of its benefits and hire the best talent there is.